Here in the UK we have all manor of diet varieties of drinks, but very few that are varieties that change other aspects. Tab Clear was a great thing - a transparent cola of sorts and didn't have the unnecessary colours. We also lack zero caffeine options, so most of us who are a bit wary gravitate towards the lemonade stand and the fruit juices. 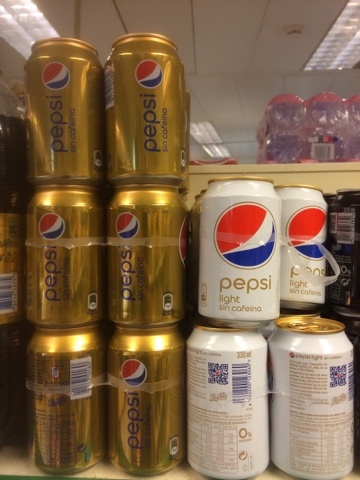 In Spain I spotted that they did Pepsi without caffeine (Sin Cafiena) and we needed drinks for the hotel so I picked up a 2l bottle - but took a picture of the prettier gold cans. I was surprised by how similar this tasted to regular UK Pepsi and was really pleased with it. I know that these cola drinks are bad for me and that I'd be better off with a bottle of water, but sometimes on holiday it's nice to be a bit bad and try these things. If you are used to the lack of buzz from decaf tea then you'll be fine with this, and it seems a suitable alternative to the full caff Pepsi. I didn't try the no sugar no caff version as I'm not familiar enough with the diet Pepsi to tell. I've been drinking the diet caffeine free Pepsi for about a year, it's fantastic. Up until recently it was only available in Asda, but Sainsbury's have now started selling it too.